Last week we looked at how silver supply could be dramatically pinched if Indian citizens began an earnest shift from gold to silver. This week we’ll continue looking at supply, this time with gold. The frightening thing about the coming gold supply deficit is that it doesn’t require an outside force to make it happen. It’s locked in. I hate to use the word “guaranteed,” but regardless of any other development, new gold supply is going down. Worse, there’s little that can be done to reverse the trend. If You Spend Less Looking for Gold, What Do You Get? 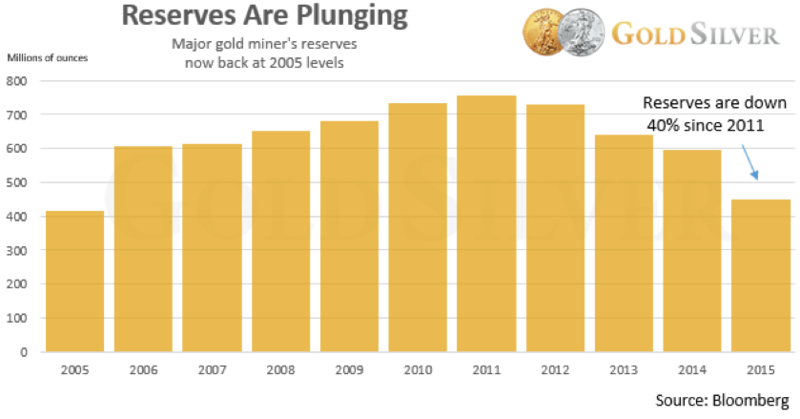 The following charts paint a clear picture of what’s happened to the gold mining industry. When the gold price was soaring, producers spent lots of money looking for metal. But when the price crashed, guess what they cut back on? Exploration spending was one of the first categories to get whacked, because it’s an easy way to quickly reduce costs when you’re making less money. 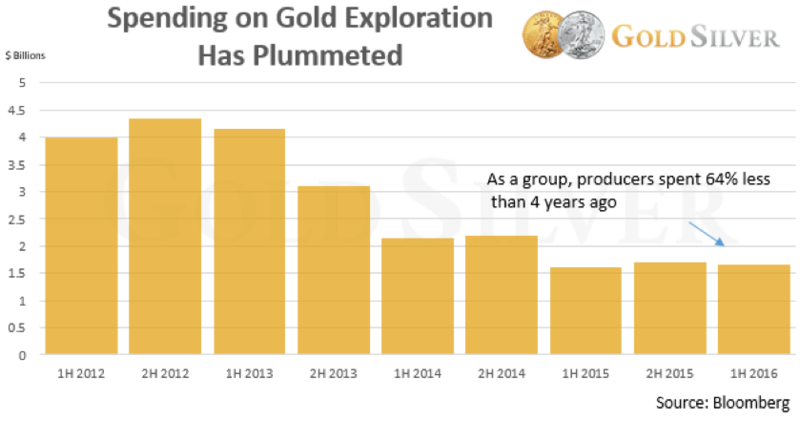 The amount of money spent exploring for gold has fallen by two-thirds just since 2012. This is a stunning drop—because if you spend less time and money looking for gold, you will, of course, find less gold. Here’s proof. 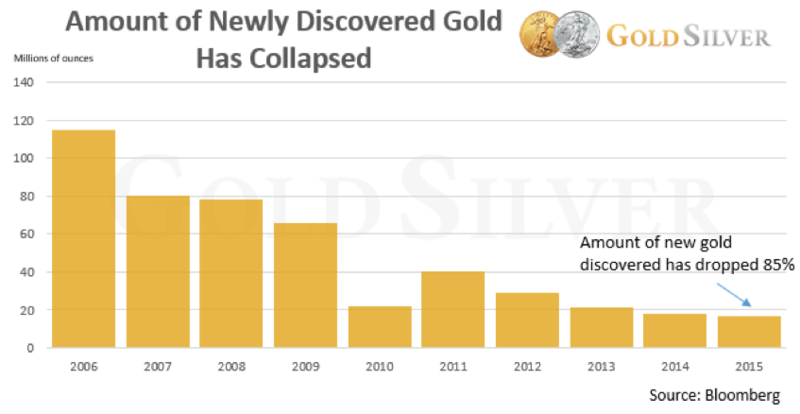 Even before the gold price got hammered, check out the trend in the amount of gold that’s been discovered over the past decade. It’s incredible, but the number of gold ounces the mining industry has brought to market has plunged by 85% in just 10 years. But it’s worse than this. Not only have many producers cut exploration funds, they’ve spent less on development, too. This basically means they haven’t built the infrastructure needed to produce more ore, for both existing projects and upcoming ones. So even if the gold price shoots up tomorrow, it’ll take years for them to ramp up production and be capable of bringing more ounces to the marketplace. Because of all this, as well as a lower gold price, the amount of metal that’s currently deemed economic has fallen. The word “reserves” carries some legal definitions, but suffice it to say that it refers to ore that has a high level of confidence of being in the amount the company thinks it is. Well, look what’s happened to reserves just since 2011. The amount of mineable ounces around the world has fallen by over a third just since 2011. Clearly, spending less money looking for gold leads to finding (and digging up) less gold. This trend is also partly due to what’s called high grading… most deposits have both low and high grade ore, and what management teams usually do is mix the ore to get a more consistent grade running through the mill. Well, when the gold price fell off a cliff, what do you suppose management teams did? Many of them mined just the high grade portion of their deposits. This allowed them to remain profitable at lower gold prices—but what it also did was not only deplete their reserves at a much quicker pace, it left behind low grade ore that in many cases is no longer economic. That’s because it required the high grade ore to be feasible, and now it’s gone. Much of this ore won’t be economic at higher gold prices, and even then miners will be very reluctant to take the expense to dig it up when it’s so low grade. Final production numbers for 2016 aren’t out yet, but most analysts agree that the total will be less than it was in 2015. If so, the beginning of the fall in mine supply has started. But even if it hasn’t yet begun, it’s virtually inevitable that it’ll soon get underway, as the above charts imply. Every analyst report I’ve read on the topic projects mine supply will fall over the coming years. The only point they disagree on is how soon it kicks in. They all recognize that underinvestment in the industry will have years-long consequences. How long will the supply crunch last? Credit Suisse estimates that even if the gold price rebounds, supply in 2022 will still be, at best, 4% lower than 2015. BMO Capital Markets thinks mine supply will still be falling “through at least 2025.” (I certainly wouldn’t look to any of these companies for gold price projections—they’re almost always wrong—but they do have armies of analysts working in the mining industry). • It takes years to bring new projects on line. Even mothballed projects can’t resume production quickly. It takes time and money and many employees to ramp up exploration, find economic deposits, develop them, and reach commercial production. • Management teams will be very hesitant to significantly increase exploration and development costs until gold prices are significantly, and sustainably, higher. They got burned over the past few years, and won’t be eager to open that spigot until the gold price is not just high, but looks like it will stay high. • Even at an average gold price of $1,300, supply will still fall. Every analyst has a different number for the “average” cost to produce an ounce of gold, but the more reputable ones are around $1,200 per ounce (this includes the total cost of mining operations, which is higher than the headline numbers you see companies report). So as you look at today’s gold price, how much money do you think miners are really making? If most can’t turn a true profit until gold is above—and stays above—$1,200, how much money do you think they’ll spend on exploring and developing new projects? The industry won’t come to a standstill, but the point is it’s not going to grow at anywhere near current gold prices. • This is also true with recycling. Generally speaking, this source of supply needs high gold prices to make it worthwhile for recyclers to run their operations at full tilt. Again, the recycling industry won’t die, but neither will it grow without markedly higher gold prices. The only scenario that could reverse this trend is if the world reached true economic growth and stability. I don’t know about you, but I’m not holding my breath that that’ll happen anytime soon. The global debt, currency, and fiscal problems all have to be rectified first, and as Mike insists, it’s hard to see how that happens without some sort of major crisis (or more likely crises). The decline in mine supply is important, because it’s the single biggest source of new metal coming to the market. So if your #1 source of supply drops precipitously, and is expected to stay down for years, it will naturally have ramifications on the availability of metal. And don’t think that those arguments about the massive above-ground supply of gold changes anything. Yes, the amount of gold around the world is big, and yes, most of the gold ever dug up is still in existence, and yes, supply only rises by about 1.5% per year. • Are we going to tear down the Sistine Chapel so we can melt the gold to remake into Eagles? • Will we reduce how many computers and cell phones we manufacture? • Would you like to dig up corpses at the graveyard to recover the metal in old teeth? Remember, only about 15% of gold supply goes directly into coins and bars for retail investors (this excludes central bank buying and Indian jewelry). The biggest chunk of that comes from newly-mined gold. And don’t think you’ll just buy bullion from the existing supply of coins and bars. They won’t realistically be available. If gold prices are soaring, investors won’t be selling—they’ll be buying. This will further reduce the amount of investable gold for us to buy. 1. The gold price will be forced up by this factor alone, regardless of what else is happening at the time. In fact, imagine an environment where Mike’s predictions come true at the same time a supply crunch starts to make headlines. 2. Bullion will be increasingly difficult to obtain and expensive to buy. Premiums will undoubtedly be higher, delivery times longer, and rationing a distinct possibility. 3. Selling during a supply crunch will maximize the profit of early buyers. We will fetch fantastic resale prices, retrieve much of the premium we paid, and have plenty of eager customers. Selling during a mania? There’s only one other thing in life that gives me goosebumps. Clearly, if the coming supply crunch gets anywhere near as bad as many analysts think it could, you will be well rewarded if you're already positioned—or hurt if you’re not. Either way, it will have a meaningful impact on your financial standing. My advice is to buy now, while gold is plenty available and relatively cheap, before the reality that’s staring us in the face starts to take hold.